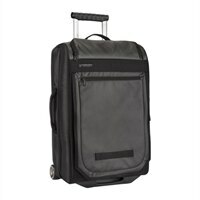 A favorite among globetrotting Timbuk2 fans, the Copilot is lightweight and easy to pack. Its sleek improved styling works downtown or way out of town and its handle system and broad-base skateboard wheels yield a smooth roll. Its clamshell structure makes it easy to pack and repack, while always providing the opportunity to quarantine things as needed. The Copilot features multiple reinforced grab straps for an easy heave-ho into overhead bins, and its expandable top stash pocket is designed for easy access in said bins. Light, organized, and subtly chic, the Copilot is ready to board.